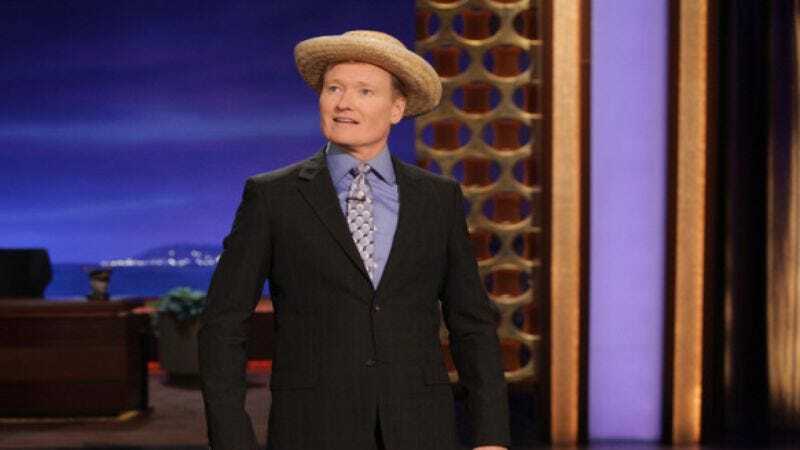 To a certain kind of person, Conan O’Brien’s years of work as a late-night host, TV producer, and actor are all mere sideshows to the comedian’s true legacy: “Marge Vs. The Monorail,” which O’Brien wrote for The Simpsons more than 20 years ago, and which is often held up as the greatest episode of one of the greatest TV shows. In an interview with Buzzfeed UK, O’Brien revealed that he’ll soon be revisiting the tale that put Brockway, Ogdenville, and North Haverbrook on the map. As part of the Hollywood Bowl’s celebration of The Simpsons’ 25th anniversary, O’Brien will take on the role of fast-talking, penknife-having con-man Lyle Lanley (originally portrayed to perfection by the late Phil Hartman) and perform “The Monorail Song” with the Gay Men’s Chorus Of Los Angeles. Normally we’d make another winking reference here to one of the episode’s thousand or so quotable lines, but you folks probably have that covered. The concert, hosted by Hank Azaria and featuring performances from most of the show’s cast, is set for early September.